Elesha Paul Moses has paid her dues in the entertainment world; she’s been striving for success in the music business for 20 years, via traditional grafting and TV talent shows. And now, she’s set for a fresh start, taking her singing career to a new level starring in the mammoth tribute show tour What’s Love Got To Do With It?, celebrating the music and life of rock, soul legend Tina Turner. Elesha, 38, who comes from Hampshire, appeared on The X Factor in 2010, alongside One Direction, winner Matt Cardle and in the same category as the big-haired, bongo playing wild card contestant Wagner. She then reached the battle rounds – twice – on The Voice, with will.i.am in a duo in 2013 and Tom Jones as a solo act a year later. She had previously been mentored by Mathew Knowles – Beyoncé’s dad – on a Channel 4 talent show. In recent months she’s toured the UK and Europe as the understudy Whitney Houston in Whitney: Queen Of The Night, a show she will also star in as the late, great vocalist during 2019 – including a sell-out West End premiere at the Savoy Theatre. Brought to you by the award-winning producers behind Whitney: Queen Of The Night, What’s Love Got To Do With It? – coming to the Southend Cliffs Pavilion on Tuesday, February 26 – is the ultimate tribute concert paying homage to one of the most iconic musical artists of the 20th Century. We spoke to Elesha about her love of performing, and how she can’t wait to party with Tina fans all over the UK. How does it feel to be launching a brand-new tribute show, paying homage to a rock and soul legend like Tina Turner? It’s mad, and still hasn’t really sunk in yet. I was pretty full-on with Whitney: Queen Of The Night towards the end of 2018, so didn’t have too much time to think about it. But then we went into full-on rehearsal mode for What’s Love Got To Do With It?, and I’ve seen so much love for the show on social media and banners at theatres that it suddenly started to feel a lot more real. I’ve been working hard on the vocals and the costumes are all ready, so we can’t wait to actually get on the road. When I first started singing – well, when I first realised I could properly sing I was about 13 – I was always mimicking others and that’s how I taught myself. But that real big belting voice wouldn’t necessarily come out. Then, listening to people like Whitney Houston and Mariah Carey, those kind of artists, was when it really came to me. Funnily, I didn’t really listen to Tina Turner when I was younger, my parents played her music in the car, but it wasn’t what I took to at the time. I was singing in a club and a friend said ‘We should do something different’, I said ‘Shall we try Whitney or something?’. I went home, put down a couple of lines of Whitney and thought ‘Oh, I can sound like her’. It went from there, and a similar thing happened when I started with Tina. I didn’t know I could sound like her until I just gave it a go. It wasn’t perfect straight away but I’ve progressed the sound over the years. What’s it like to recreate such an iconic female performer live on stage? Tina’s not got a growl as such, it’s just something which is there in her tone. It’s really difficult to explain. People think it’s shouting but it’s not, it’s a very particular tone that she has. When I started mimicking Tina, it was great to watch her and learn from the energy and fun she puts in, and her way of moving is so distinctive. She’s so free with her performance, and carefree running around, kicking her legs up – it’s so much fun to take that on, and it’s an amazing quality not many artists have. What’s your favourite song to perform as Tina Turner? Oh, there are so many I love. Proud Mary is obviously so much fun, but I also love Typical Male and I Can’t Stand The Rain. But for my absolute favourite… I’ll go Proud Mary. It always used to be Simply The Best which people really loved and went mad for – but these days it’s definitely Proud Mary. Tina Turner is still such a huge name in music, why do you think she’s still so popular? She is just such a great all-rounder, and she appeals to men as well as women. She’s a great rock and roll artist, she’s still here and she’s still doing so well. Her songs have never gone away either. Even youngsters now, they know tracks like Proud Mary. You do those songs and they’re all over it, and it’s not fading away. Tina’s had difficult times too over the years, but she came through it and is married and happy now – and I think people like that side of her story too, as well as the brilliant music. You’ve been working in the music industry for a long time – you started writing with a record company aged just 17 and have been on TV reality talent shows. Can you tell us about the switch to the world of tributes? I never used to do tributes, I was striving to do my own stuff and put out my own music. Things happened in my life, and I was in between things not really knowing what to do. I didn’t know how to get into the tribute business, but at the same time I felt that by doing that I would miss doing my own thing too. But I’d done my album and did lots of trying to make it before doing the TV shows. I’d tried the traditional, old fashioned methods to get signed. It was just never meant to be. So I decided it was time to take it away from me and into being someone else. Doing both of these did give me a boost at the time, even though I got so close but ultimately wasn’t successful. I don’t know what people think of me as an artist having done those shows, but I’m glad to be moving on into this new camp now. I’m 99.9per cent – no, make that 100per cent sure I wouldn’t be tempted to do it again. Forget being mentored by Louis Walsh – tell us about working with Mathew Knowles, Beyoncé’s dad! So, yes, I did a TV show a long time ago, where I was mentored by Mathew Knowles – Beyoncé’s dad – that was pretty mad. It was Chancers on Channel 4’s T4, and I won the chance from UK auditions to spend a month in Houston, America, where the group of us chosen had various challenges. Mine was to sing at the same studio where Whitney Houston had recorded. That experience gave me a really tough skin, to know that whatever you do don’t worry about what’s happened in the past; it’s all brought me to where I am now. 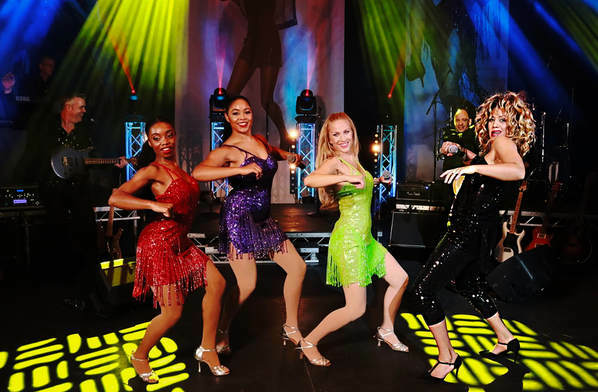 In this brand-new touring theatre show, audiences can expect a night of high energy, feel-good rock-and-roll featuring Tina's greatest hits performed by the amazing vocal talent of Elesha Paul Moses (Whitney - Queen Of The Night, The Voice, X Factor) supported by a full 10-piece live band.